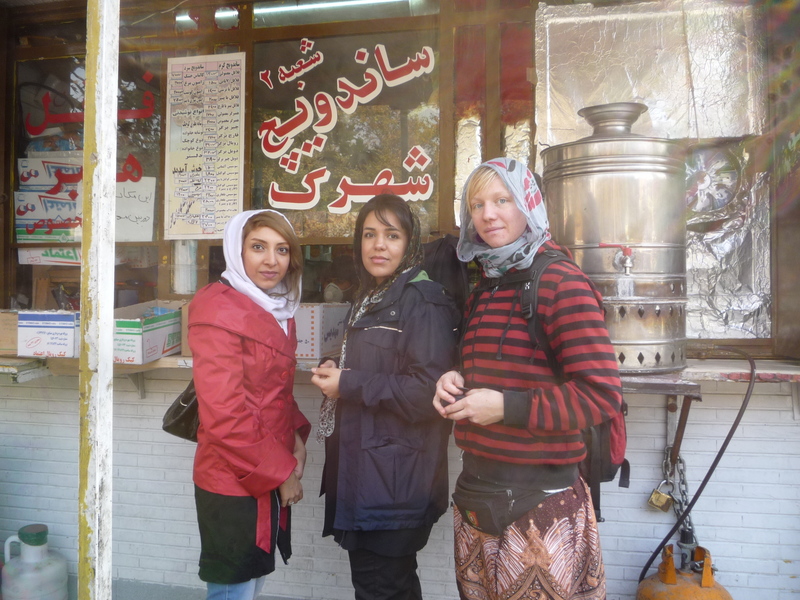 I hitchhike with my friend, Sara, from Turkey to the Iran border. The first Iranian we meet is a border guard, and possibly the most beautiful man Sara and I have ever seen. We look at each other and burst into fits of giggles. Since that day, Sara and I have been constantly commenting on how good looking Persian people are. The women, in particular, are stunning. From the border we hitch a bus to Tabriz. 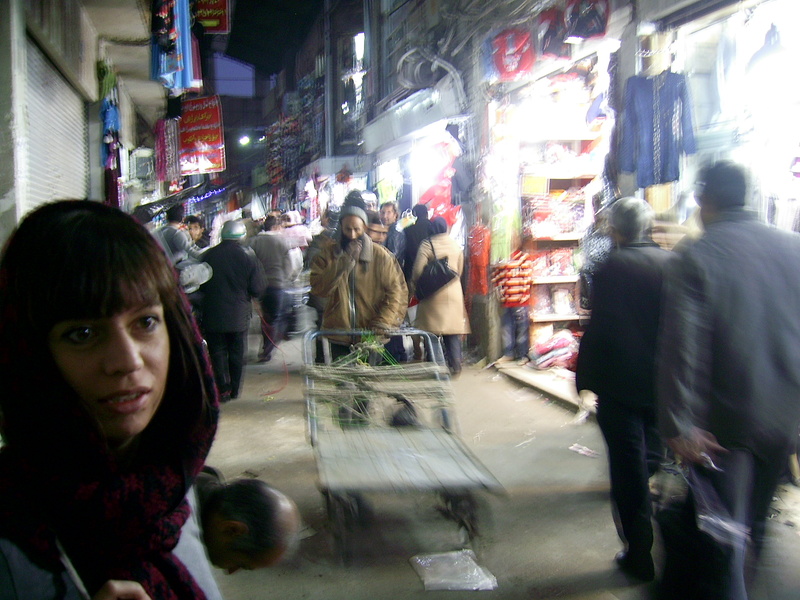 Tabriz is crazy in the daytime…people, cars and men pulling carts of goods everywhere. Not at all like Turkey! The population here is Azeri (Iranian Azerbaijan), and not Persian. Their language is similar to Turkish (luckily for us). We are told that the government is trying to phase out their language by teaching only Farsi in schools. We learn that Iranian people are unbelievably helpful. If you ask an Iranian for directions, they will literally stop what they are doing and take you there themselves. Which is just as well, because simple things like changing money seem impossible without local help! Our Couchsurfing host can not host us, so he takes us to his girlfriend’s family home. 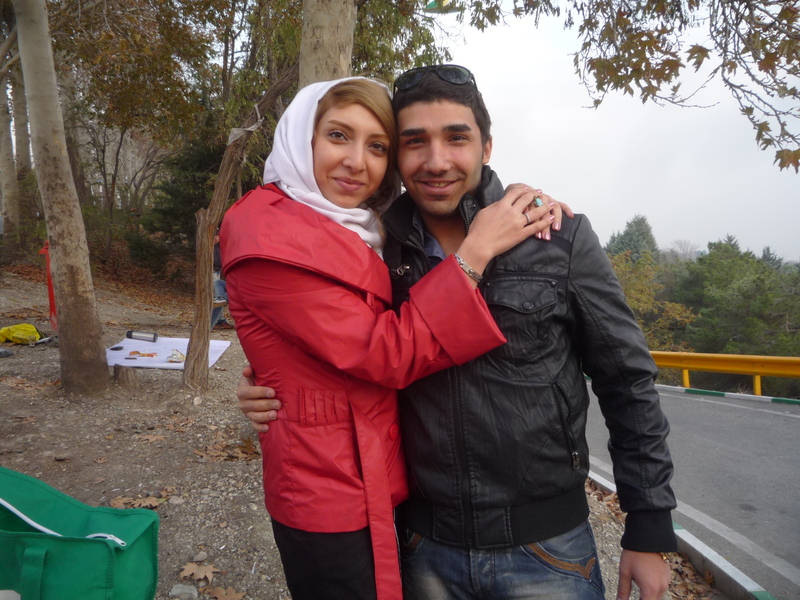 His girlfriend is possibly the most beautiful woman in Tabriz, and we become close to the whole family. They even take us to meet grandparents, uncles, aunts and cousins. The openness and generosity of this family is humbling, and we feel sentimental about being accepted by them so wholeheartedly. 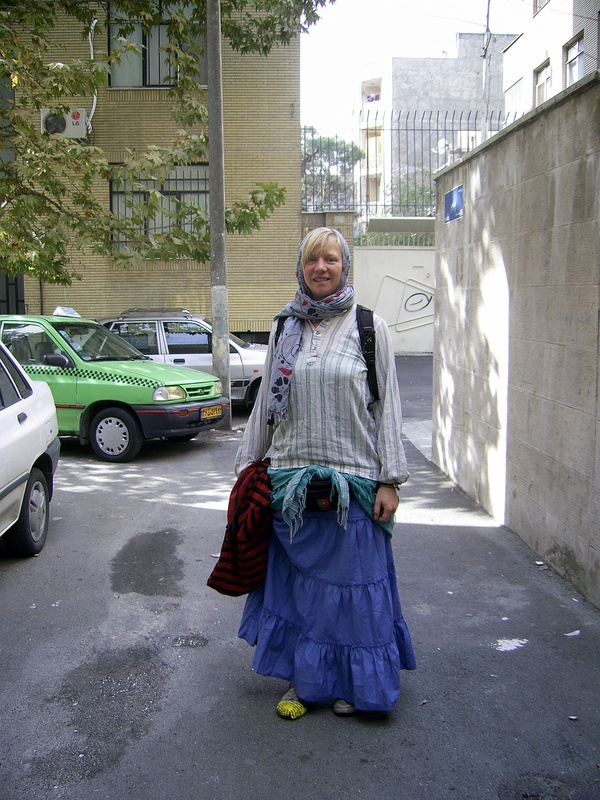 We find it hard to adapt to the Iranian dress-code and look ridiculous! We have to wear something long over our trousers, just in case (shock horror) someone should see the outline of a woman’s bottom. 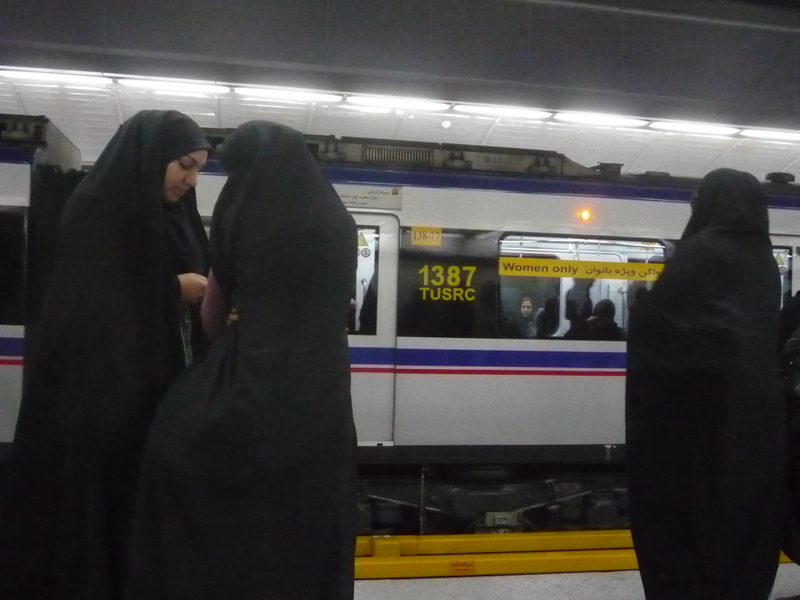 We are brightly coloured, whilst the whole of Tabriz is wearing black. Locals look at us and giggle. Our host takes us clothes shopping, telling Sara, “you don’t have a choice”, implying that she looks ridiculous. Throughout the day our host makes comments on how poor Sara looks. 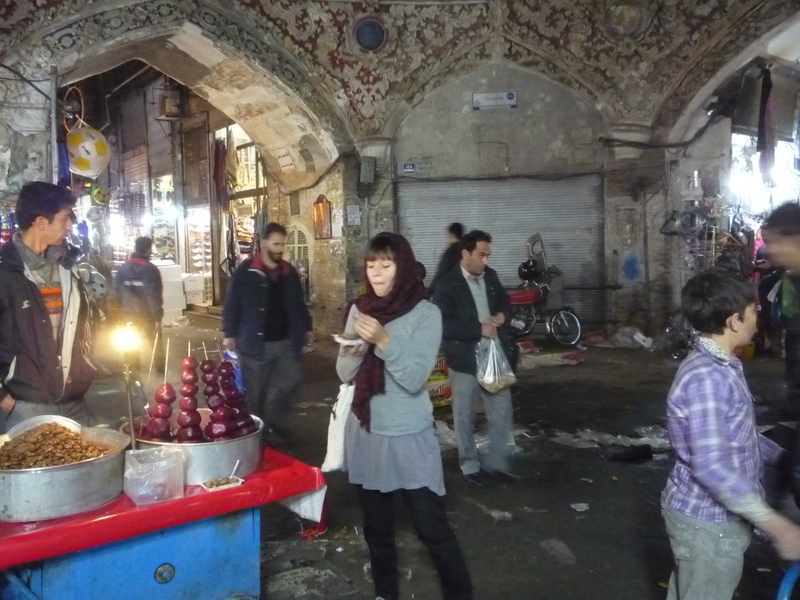 Sara is one of the 1% of people who wear bright colours in Tabriz and Tehran! Tehran is a smoggy city, with rush hours as stressful as London (with an underground system that is more crowded) and traffic more manic than Bangkok. Tehran is known for its traffic accidents, and I wonder whether we will leave this city alive. We learn the local way of crossing the streets – walk out into the speeding traffic and dodge the cars. Simple. Having finally mastered the dresscode (I have converted to the dull, dark colours and learnt how to wear my headscarf), most people assume that I am Iranian, speaking to me in Farsi. Sara, meanwhile, keeps her identity and wears brighter colours every day. 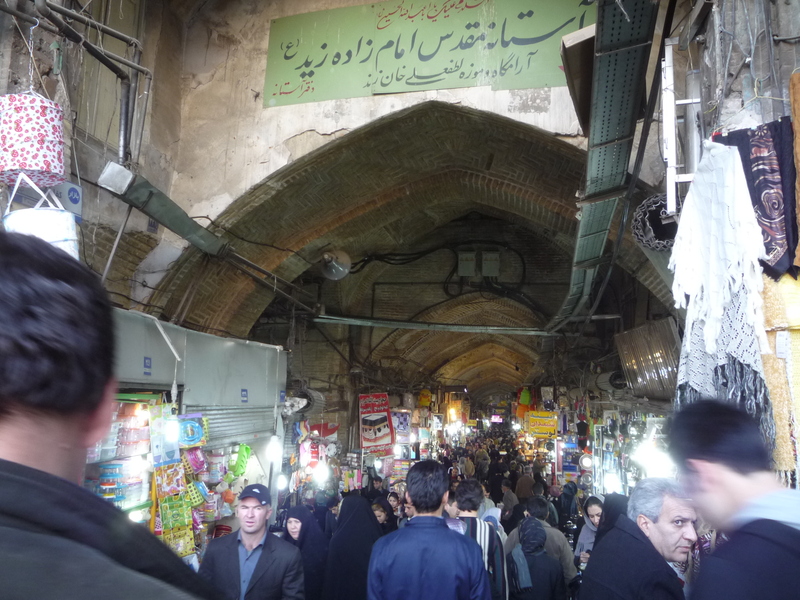 Tehran has an amazing bazaar. We shop here for hours, dodging the people, motorbikes and delivery carts. A man deliberately touches my bum (or arse…I can’t think of the best word!) and it’s the second time this has happened in a couple of days. I yell and punch him hard. He continues walking. (This behaviour is an exception, however, and most men are very polite and courteous). The capital city expels a lot of myths that I had previously believed. For example, I was led to believe that men and women couldn’t interact in public. In reality, we have frequent conversations with men, looking them in the eye and even smiling (gasp!). There are strict laws involving women’s dress code. A lot of these rules are ignored and many women wear their headscarves so that they are barely on their heads. They wear copious amounts of makeup and spend a lot of time on their perfectly plucked eyebrows. Iran is also the plastic surgery capital of the world (well, so says the Lonely Planet…), and at least five times a day we see men and women with tape over their noses. Apparently, a nose job is seen as a status symbol. There are frequent police checks on women’s dress-codes. Female officers wait at the top of metro stations, waiting to pounce on people. They arrest women and take them to the police station and fine them. Satellite TV is banned, but the locals seem to get around this. BBC Persia is very popular, and I wish I could understand Farsi. Are the BBC journalists reporting with a British agenda?? 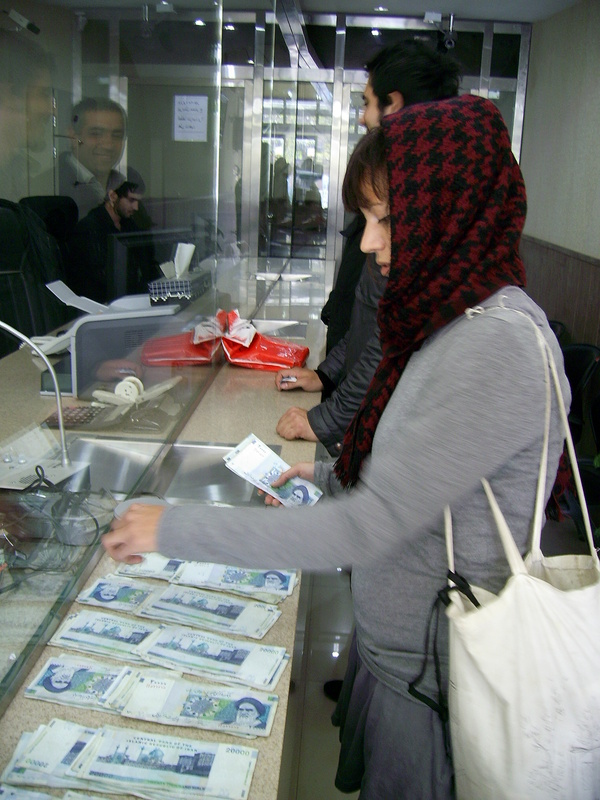 It’s unclear to us whether Iranians befriending foreigners is illegal or not. We hear differing opinions. One friend says that he should report our meeting to the police, whereas others say that having foreign friends is no problem. Another friend tells us that if the police come we should pretend not to know each other. Vegan food is relatively easy to find, with soup available everywhere, and street food such as samosas, beans and even hot beetroot being sold. And falafel is sold in most fast food places. Alcohol is banned, but seems relatively easy to come by, if you know the right people! (Though we are told that the punishment is lashing if you are caught). 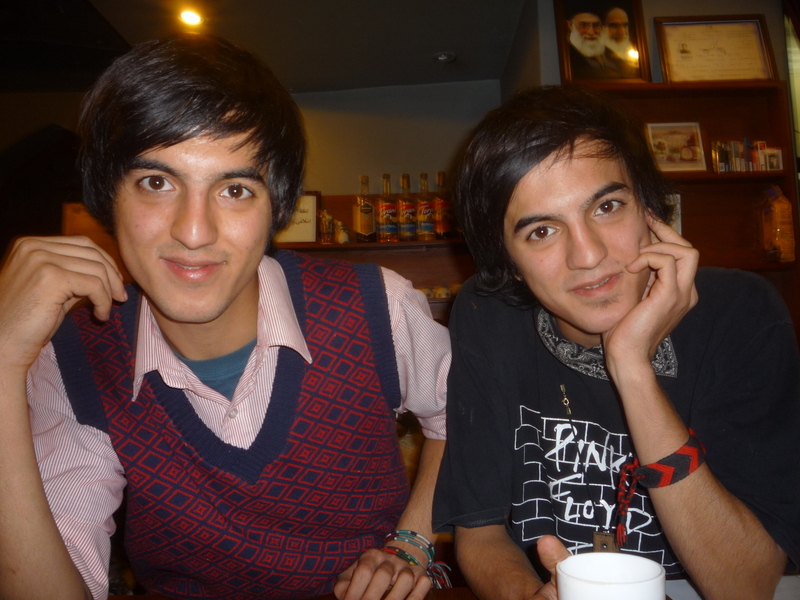 Our first week in Tehran is a lot of fun and we love the cafe culture (because bar culture doesn’t exist!) There are some really cool cafes here, and a good mix of alternative and artistic people. We go to one particular place every day, quickly befriending the lovely staff. We are so comfortable with Tehran life that we are spending ten days of our 30-day visa here…we really need to leave!!! I’m Iranian and I had the pleasure to see this magnificent country after 15 years. (Grow up in the US) Just wanted to say I enjoyed reading about your visitation, I had a fantastic time during my 3 month stay and am looking forward to visiting every summer!! !